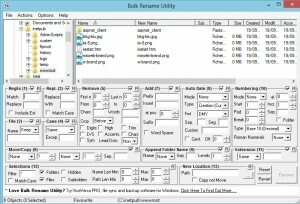 Bulk Rename Utility is an easy to use file rename program (a.k.a. file renamer). 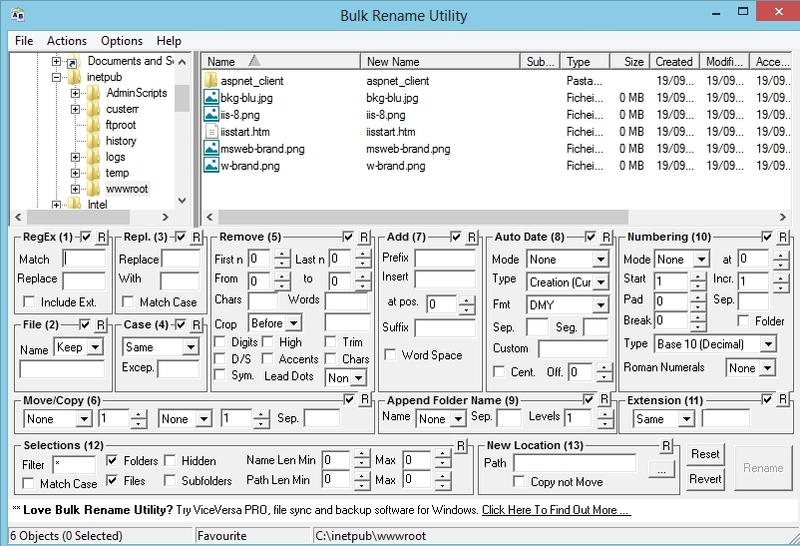 Renaming multiple files has never been easier! It has a small memory footprint so it can be left running all the time without consuming all your memory. It started as a freeware Visual Basic tool, but as its popularity has grown it has been completely rewritten in C++ to be robust and lightweight – and very, very fast! It can easily handle folders/discs containing well over 100,000 entries… and it can batch rename 1,000s of files in seconds. The software is freeware and gets downloaded very frequently. It has a large base of regular users. Most of the features have originated from other users’ suggestions. As such, it is continually being enhanced and improved. As well as being “recommended” by a number of web sites, Bulk Rename Utility has also appeared on many magazine cover-discs, from Brazil to Sweden. Google Chrome Ã© o nome do browser do Google.Â Released!! O programa estarÃ¡ disponÃ­vel em versÃ£o beta a partir de terÃ§a-feira (2), em mais de 100 paÃ­ses. A empresaÂ promete lanÃ§ar um programa â€œmodernoâ€? e â€œsimplesâ€?. â€œComo a pÃ¡gina homepage do Google, Google Chrome Ã© limpo e leveâ€?. No windows 2000 e XP o comando nÃ£o existe mas basta colocar o executÃ¡vel no %system root%\system32 e ele vai funcionar. Folder Size for Windows adds a new column to the Details view in Windows Explorer. The new column shows not only the size of files, but also the size of folders. It keeps track of which folders you view, and scans them in the background so you can see complete size of all files within the folder. It’s very useful for cleaning up your disk. Once you get used to having that information available, a directory listing simply looks incomplete without it! A Microsoft lanÃ§ou o Private Folder 1.0, que cria uma pasta “My Private Folder” (Pasta Particular) que sÃ³ pode ser acessada com uma senha.A ferramenta protege dados particulares em computadores compartilhados com amigos, colegas, crianÃ§as e familiares. O software cria uma pasta por usuÃ¡rio do Windows XP e requer validaÃ§Ã£o no programa de Vantagens do Windows GenuÃ­no.